Here is a great video you need to implement for patient education and VALIDATING your care. As a member you will be given what you need on a "silver platter" to educate, document, and increase your referrals based on your expertise. Abstract: Ligament injuries are among the most common causes of musculoskeletal joint pain and disability encountered in primary practice today. 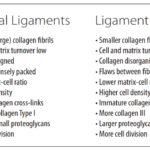 Ligament injures create disruptions in the balance between joint mobility and joint stability, causing abnormal force transmission through the joint, which results in damage to other structures in and around the joint. The long . . .